WMR was back on the air again on Sunday morning 7th February with a new show, featuring the closedown in 1988 of Westside Radio, and a few tributes to the various famous rock artist's and presenters that have recently passed away. Signal was very respectable in the target area and the band would have been described as being good to us. The programme is as always available in the "listen again" area of this site. NB: We were on the air last weekend, but it was the repeat of an old show, due to not having time to prepare a new one!!! WMR has been back on the airwaves this December with a couple of new programmes. We were on the air on Sunday 20th December, Boxing Day, 26th December, and also on 31st December. We have not done too much this year, but at least we managed some transmissions at year end. The broadcast on Hogmanay this year featured a recording of the closedown of ARD Radio from Dublin in 1979. This did drag on a little perhaps, but it was a historic recording worth a play. We were unable to make any live transmissions this year, but who knows what we might conjure up for 2016. The latest programmes are now available in the listen again area..
We are looking forward to some further transmissions in early 2016. But for now we can only wish all the dxers out there a very happy New Year 2016!! We made it!!! Yes, WMR managed on the air this past Sunday 28th December, and in fact had ran a few tests from Christmas Eve on 6395kHz. This consisted of a few of the shows from earlier in the year. This was all thanks to a last minute offer of airtime from MAGIC. Thanks to Mr Magic for this, which was much appreciated. We honestly thought we'd have to hit it on the head this festive season. The live part of the show went out from 1400 until around 1800GMT. The band had seemed a little flat earlier in the morning or we might have been on the air sooner. 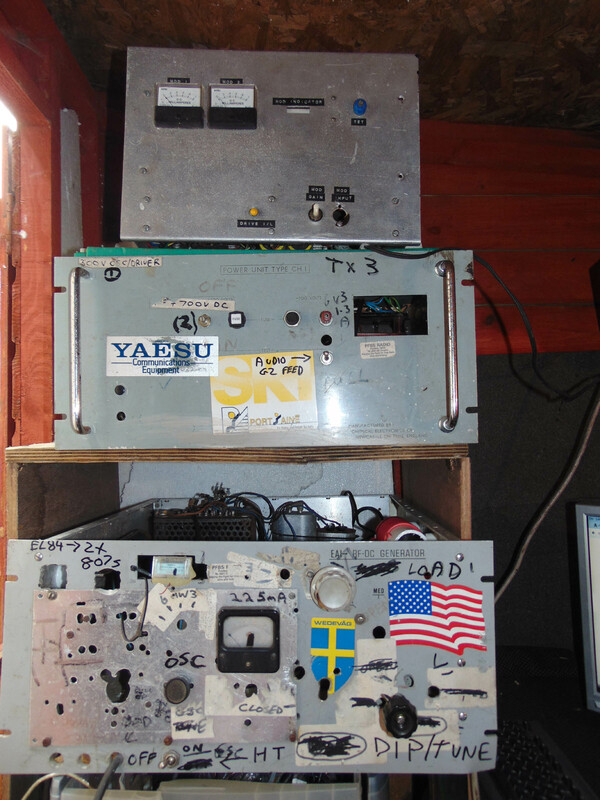 A 15mHz transmitter was operational until the propagation fell over on us, on 15705, giving good results in Central Europe. When a report from Southern Germany was heard for 1800GMT, it seems that we should maybe have given it another hour!! The signal on 6395 was booming.... The show is now available on our listen again page. WMR and RADIO GSV are taking a break for now to try and find a new remote broadcast site. The last transmission for WMR was 23rd November. This was forced upon us due to web trolls that made broadcasting from the Radio GSV fixed location too risky. We had a good run though. It is just a shame that we probably will not make it on the airwaves this Christmas time as planned. The programme on 23rd November featured a recording from Radio Woodstock from 1980, a Scottish pirate station that ran live from Falkirk for a few months, and took phone calls live on air. WMR on the air again this morning from just after 0800 to around 1000, on 6395 again. Oldies only today. No features. The last show dated 26/10 was aired this past Wed around tea time. Both shows now on the listen again section. WMR is again on the air on SW, 26th October. There were no recordings made last week, due to lack of time. The show aired this weekend, Sunday 26th included recordings of WMR from 1980, and a tribute to Alvin Stardust. QSLs have again been sent out up to today. Anyone who has not received a reply from WMR should write in again asap, while mail is up to date!!! The last couple of weekend shows have been uploaded to the LISTEN AGAIN area of the WMR web site. The broadcast for the last weekend in September featured recordings of Westside Radio from Dublin, and good old Prince Terry. The first weekend in October featured a vintage recording of Europen Music Radio. Hopefully we shall manage to find recordings of many of the other SW pirates of the past to feature in up and coming transmissions. We have been using 6395.7kHz in recent weeks. Let's hope this frequency stays clear for us. We have been trying the 5815 area of the band a couple of times, although we had to QSY back to the 6395 freq on 29th at 1930 as RTE use 5820. WMR used to at one time run bi weekly along with Radio Free London on 5805kHz. These broadcasts were very successful, and who knows, this quieter area of the band may well be a good spot to settle on. But options will be kept open!!!! 5815 was the frequency used by World Music Radio a few years ago, when they got a Danish broadcast Licence. Well that was an interesting weekend of listening on the SW. WMR was again on the airwaves on Sunday morning, but was shadowed by our creepy stalker, the hoax WMR. This unhealthy obsession with WMR has gripped the fake broadcaster of these signals since the summer of 2000!! Sunday 19th October 2014 - 6375 afternoon and closed around 1815GMT. The purpose of these broadcasts are unknown. The operator has simply been lifting old shows from the WMR web site and rebroadcasting them. Hence the reason you don't hear the most up to date show on the hoax station. So we have to of course refuse to offer any form of QSL for these broadcasts. They are nothing to do with WMR, and are not planned / authorised by the station. Would the World Service QSL a report for 27185 if a silly CBer keyed the mic up at a radio speaker and relayed the World Service for an hour? I should think not. Fur the benefit of the dxers that don't seem to be able to get their heads around a very basic and simple situation with regards to the transmitter that we are using. Our sister station, Radio GSV and ourselves are running through the same transmitter, which is pictured below. Neither station could really be described as being relayed by the other. 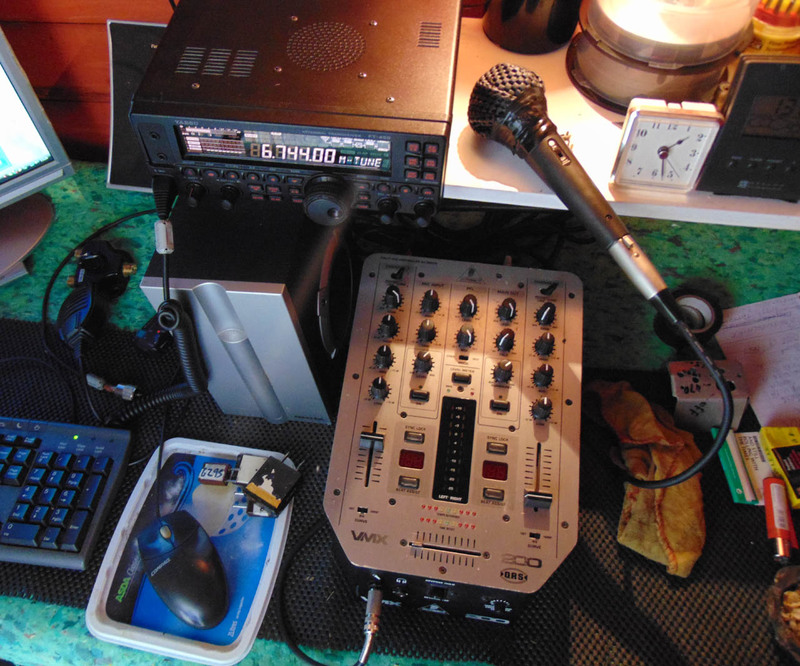 Both Radio GSV and WMR do our own style of radio, and are part of the same operation. Perhaps it can be compared to Radio Caroline and Radio Moneik from the Ross Revenge in the 80's?? In the 70's at one stage it would have been Radio Mi Amigo that was heard on the air by day, and Caroline would take to the air at night, sharing the facilities. . The programme aired last week, from around the 20th has now been uploaded to the WMR web site. See our listen again page. A CLEARER SHOT OF THE TRANSMITTER THAN THE PREVIOUS EFFORT. 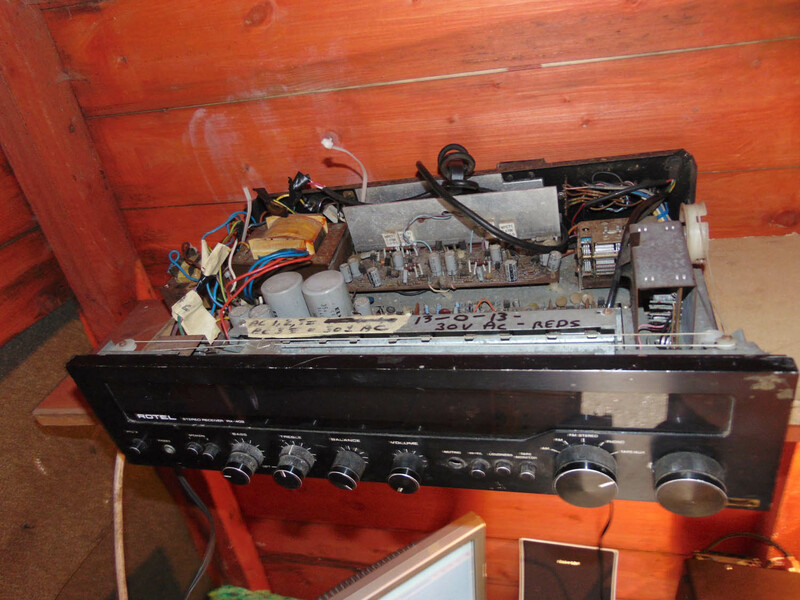 THE OLD ROTEL AUDIO AMP, USED IN IRELAND IN THE EARLY 90'S FOR RELAYS. FRONT PANEL OF THE RF STAGE. AND RIGHT, RADIO GSV STUDIO. This web site for WMR has been largely ignored for a long time. In fact the last Christmas broadcast that WMR made in 2013 was not the most successful transmission ever to hit the airwaves due to band conditions. Our link broke up a few times as well, and therefore we were transmitting dead air for some of the time. So we have not even got around to uploading our live Xmas show 2013 to the web site as yet, as there is quite a bit of editing required to do so. But if you are still listening to the SW bands you will realise that WMR is back on the airwaves again, sharing the facilities with Radio GSV, a new station from Scotland. Our first show was on 10th August 2014. Frequencies to check are 6397, 6850, 6952, or in the 48m band itself. 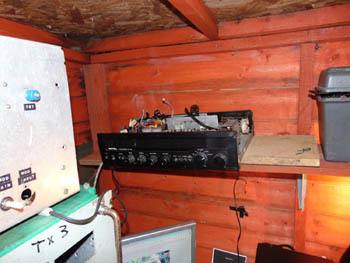 The transmitter in use is one of our old 807 rigs, which has been used in the past for many a broadcast of WMR. Although after lying around for many years a bit of rebuilding work was required. The transmitter was a former mw transmitter in Merseyside for a short lived station called KGW. We fell in with the txer in the 1980's. 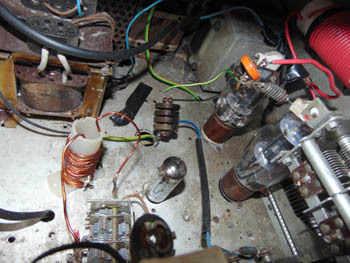 These days it is an EL84 oscilator, into a pair of 807's. The 807's are driven with about 750 volts, running the valves just nice. 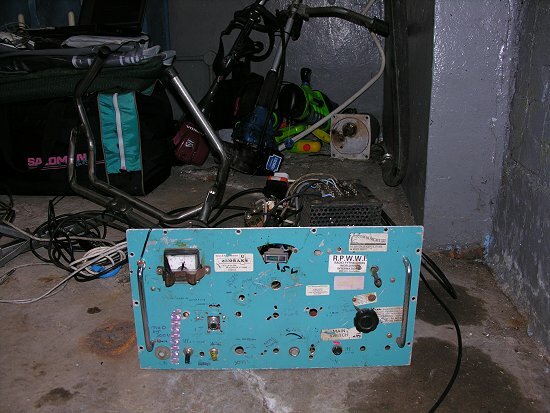 In the photo above, the top section is the modulator, which once belonged to the transmitter that broadcast the various relays in the late 80's from Dublin on 6318, and operated by Gary St John. 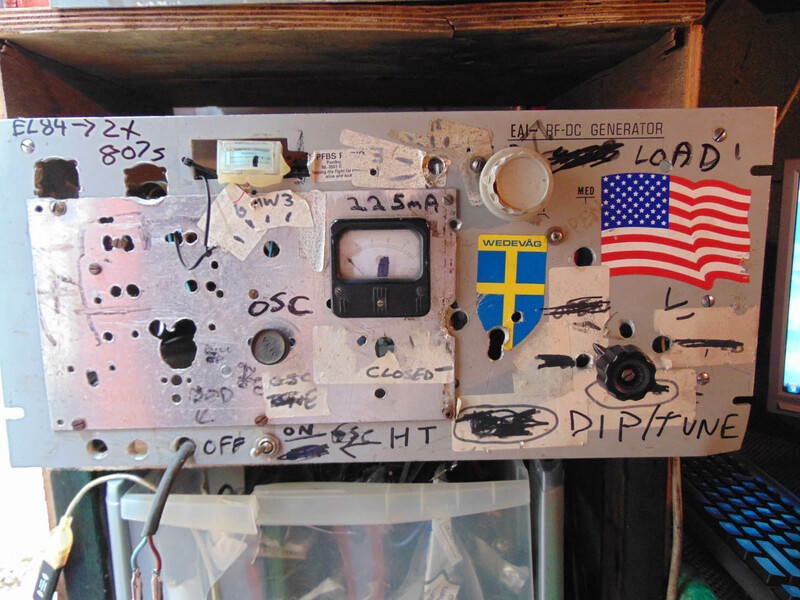 The middle section is a power unit built for this modulator in August 2014. 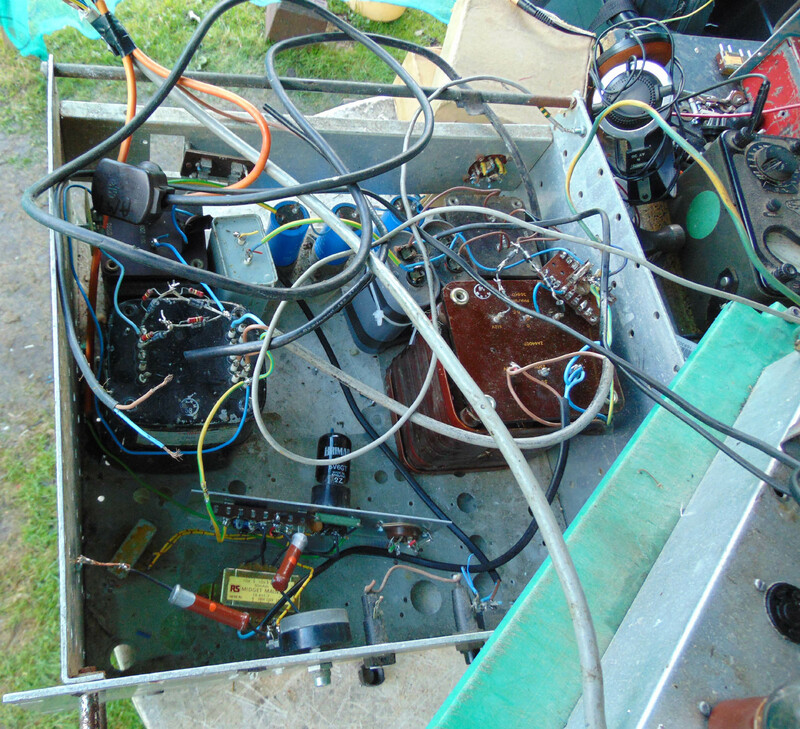 The bottom section is the transmitter, which has its own built in HT section. We shall have to try and take a decent rig photo of the rf stage, and a better complete setup image as well. 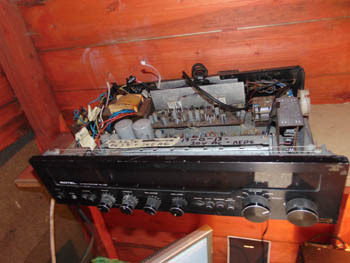 The modulator was originally designed to send audio to a single 813 transmitter using a WODEN UM3 modulation transformer. This match worked very well till the transformer became duff. 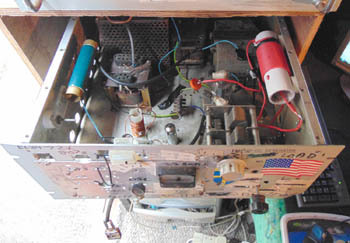 The rig was resurrected briefly in 1989 from Co Donegal, but modulation was always slightly on the low side, though acceptable, due to a mis matching mod transformer. Today the output of the modulator consists of 2 807's driven by 3 ECC82's. 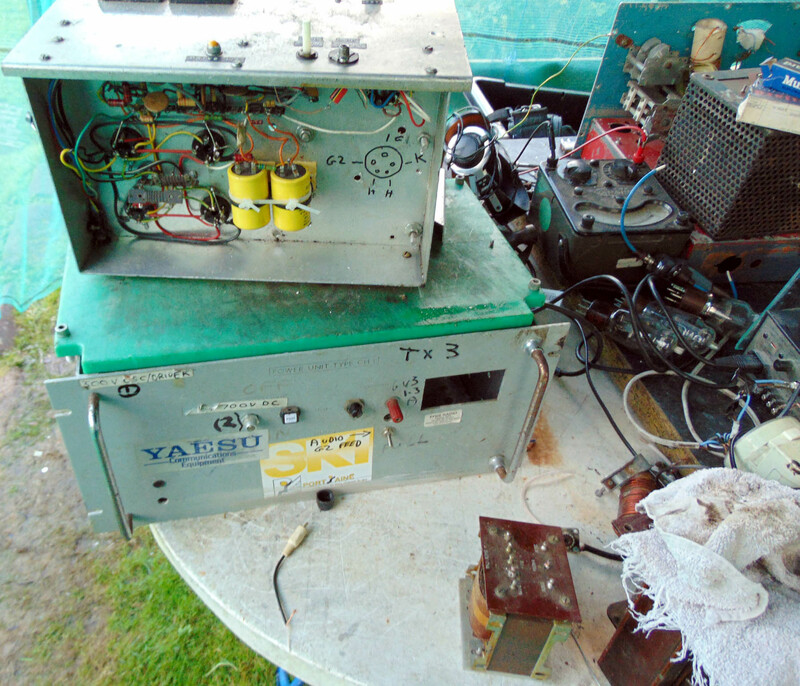 The modulation transformer came from an old Boyneside Radio transmitter in the 80's, and is still working well...!! 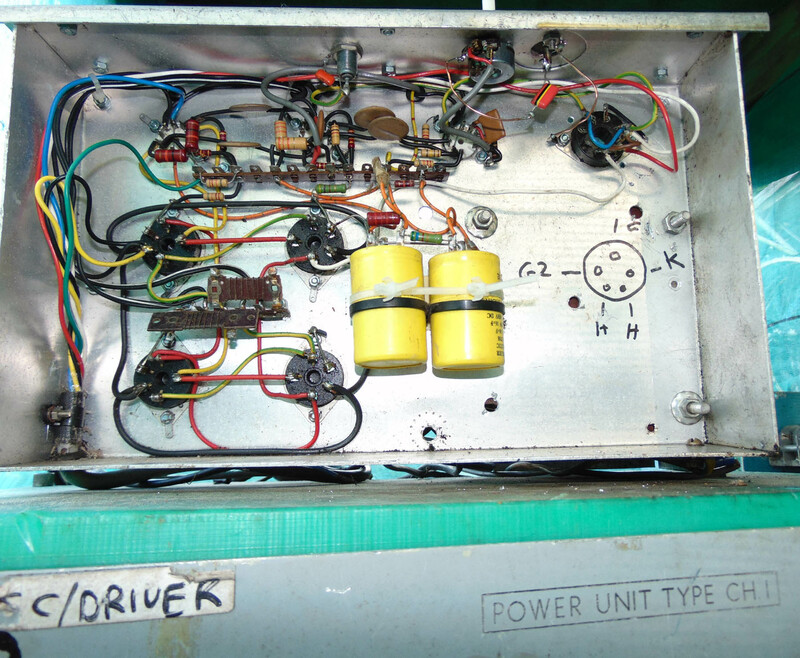 The power supply, built in August 2014 to drive the modulation stage properly. The 6V6 supplies negative bios. The black transformer on the left supplies 6.3 heater voltage, and a 250 - 300 volt line. The old brown transformer supplies 750 volts dc approx for the anodes of the 807's. Initially broadcasts were made using a simple amplifier which had been used in the past to modulate little 20 watt transmitters, but it was somewhat unsuitable for the higher power we are running with this tx. It was good enough to get on the air initially though, with our old equipment that had to be rebuilt almost from scratch. 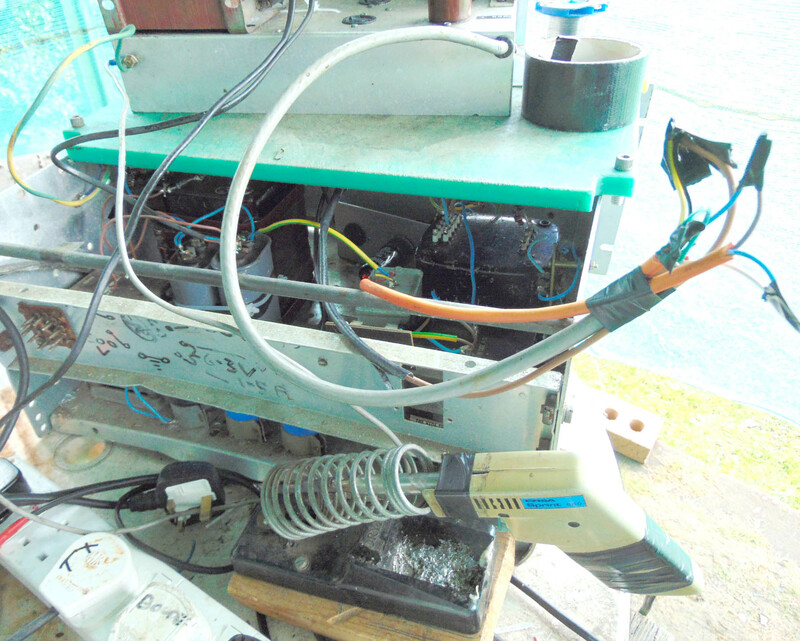 This gave us a chance to root out the old components and parts needed. Despite requiring a bit of time to work on equipment, we repeatedly received unhelpful complaints about low audio etc. Yes we knew it was a bit low to begin with. We also have ear flaps on the side of our heads..lol.. It was a temporary measure until the right match of components could be found, in the transmitter room. 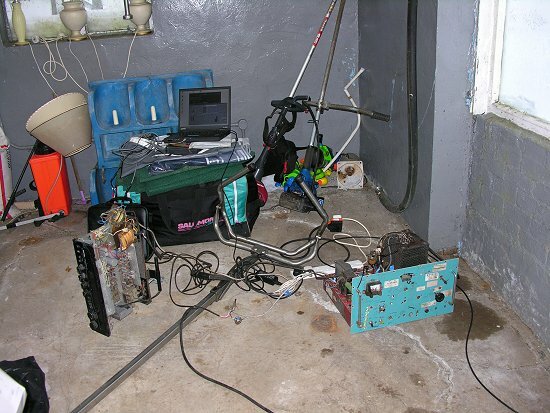 A photo of the said transmitter room may show what is meant by "give us a chance to find stuff". The underside of the modulator. This has never been used since 1990, but we were able to get it going with relative ease once a suitable power unit was built. The back side of the modulator and it's fancy connection to the power unit!! WMR was back on the air on boxing day 26th December 2012, with a good old traditional Christmas broadcast. Only Jack was on the air from around 1130 till sign off at 1710 approx. Poor old Mike was laid up with the flu!! Frequencies used were 5800 and 6400. The latter suffered some some QRM from Korea at times. All in all, a great days transmissions, and we would like to thank everyone that was listening to us direct, as well as via remote tuners across the European continent. As ever, programmes are available on demand on our WMR on line player, or downloadable as an mp3 file for your i-pod etc. Click the LISTEN AGAIN page. WMR has returned to the airwaves today on 6221kHz, after a long absense. The last proper transmission was Hogmanay and New Years day 2009/2010. So in theory, we have made it by the skin of our teeth, to continue to make the claim of being on the air every year for the last 32 years on the SW. Programmes today were exclusively a Jack three hour show. Mike was unable to come to the studio in time to record the shows. The plan this festive season was to broadcast live on boxing day, 26th December, but due to not being able to get the link to the transmitter site working, and not having prepared any recorded shows, the broadcast never happened. The plan was live with phone calls, like we used to be well known for in years gone by. Todays programmes are available on demand on our WMR on line player, or downloadable as an mp3 file for your i-pod etc. Click the LISTEN AGAIN page. It was nice to hear from our old friends again from the world of SW free radio, including the WMR past presenter, Mark Jones, one of our German DJ's. Well despite our lack of programmes over the last couple of years, the Hoax WMR is out and about again. Direction seems to be similar to the last time they were on the air. Was that a couple of years ago?? Let it be said that the transmissions on 6210 in the evening that are playing OLD WMR shows are nothing to do with the station. Remember in the past these transmissions have been deliberately malicious, and have jammed WMR. The sun has finally come back to life, and the band is looking better for low power broadcasting from the woods. Much of the 48m band has been alive again in the evening, with reliable signals. We did not make it to the airwaves in 2010, bar for the 1st January, even though it was our 30th anniversary. It is difficult to swallow the fact that it was over 30 years ago that three young fellas set off at about 6am to find a suitable secluded woodland to attempt to set up the first WMR broadcast. 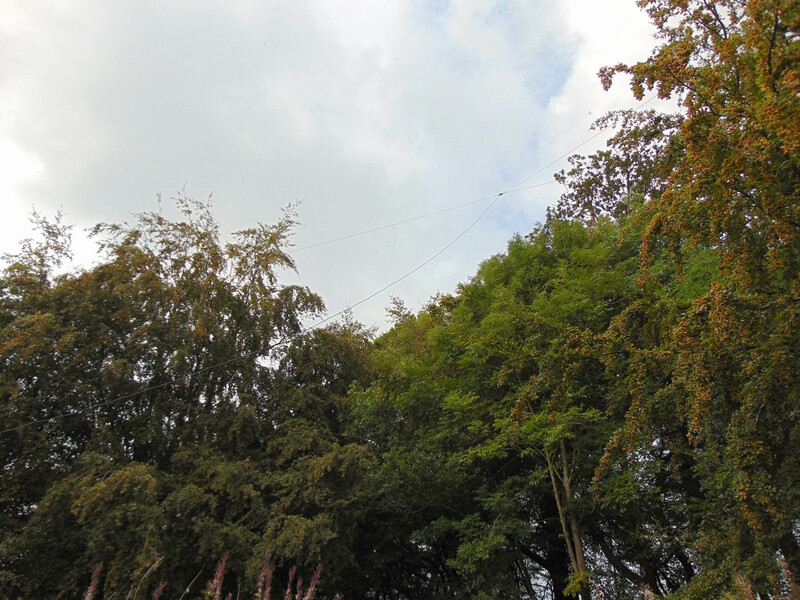 I bet the woods we initially thought were OK, when we could reach up and touch the aerial, really will be suitable now!!!! Well here we are, three weeks after the New Year transmission, and the programmes are only just being made available on line. The cold weather snap here in the British Isles and I think much of Europe left little inspiration for web design. Not that we were designing the WMR web site out on the ice. Well not quite. An opportunity arose for a site at Hogmanay, and into New Years day for a limited WMR broadcast. This went out on 6400, and thanks to our site owner, and of course to the old reliable WMR TX, the broadcast ran from evening on 31st Dec, through until lunchtime on New Years day. There was a mad rush to record a Jack and Mike show, which was eventually finished, before it was time to pack up for our Hogmanay celebrations. Such was the rush that Jack has to apologise for playing the same track at the start of his show as he did at the end of it!!!! lol. Well at least WMR was on the air. Again skip was very long and the signals were heard better in Germany than in the UK!! Pity really. There is always the listen again button on this web site. Some mail arrived from the "snail" mail drop, There were 5 from Germany, 1 from Holland and 2 from England. Most people will e mail us these days, but there are still a few who like to send in a good old fashioned letter. 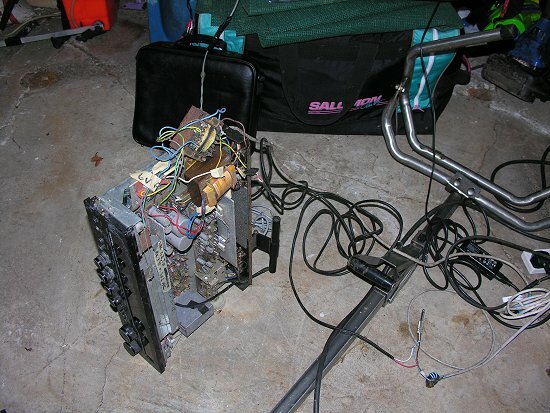 The old WMR 100watt tx, this version rebuilt in about 2004 for a failed Xmas broadcast. This rig was used for Radio Stella, and was also on 15043 in the late 80's. The antenna was a little rough too, but at least the van was parked at the right place!! 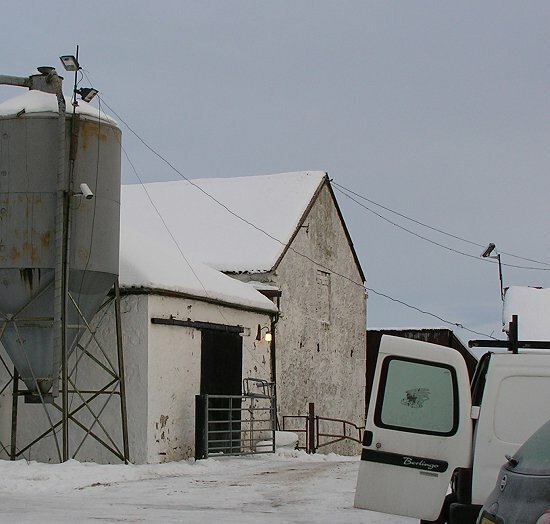 We had a successful broadcast on 20th December 2009, from around 0800 thru 1800 GMT. Freq was the old channel of 6400kHz. So far, there have been about 30 e mails, from Germany, UK, Holland, Georgia in the the USA, France, Belgium. It was good to get back on the air again, after a break of about 18 months!! In the late afternoon, there was an unauthorised broadcast of WMR shows on 3905kHz. WMR would like to point out that these transmissions are completely unconnected with WMR, and we have no control what so ever of them. This transmitter was active when we were on the air before, when the unknown malicious broadcaster jammed WMR a number of times. It is unknown whether there is more than one station/ transmitter involved. I never thought I would ever go down the road of E QSLing. It was always nice to keep up tradition of hard copy QSL cards. But the QSL replies have already been e mailed out in a pdf format to all the listeners who e mailed us at the weekend. One dxer promised to send a letter as well, with some postcards etc of his qth. If a hard copy QSL is desired, they will be sent out anyway, without the need to send snail mail reports. WMR is back on the air again tomorrow on 6400 for a few hours. Check the "listen again" page in the audio menu to download the programmes. There may be a stream available tomorrow, so that the files start playing straight away. There are four hours, 2 separate 1 hour shows from Jack and Mike. WMR has at last made it back on line, after some problems with the previous hosting service. The web pages are of a similar design to the site that abrubtly left the web last year. The main difference is that they will be of a much simpler nature and less cluttery. There are two audio download pages. One for short clips and jingles, and the other for full programmes. WMR has not been on the airwaves in 2009 at all, bar a few carrier tests. But we have not given up, so stay tuned to the receivers in the months to come. You never know what you may hear. The SW has not been particularly inspiring of late mainly due to the lack of sunspots. It is said that a spotless sun is good for MW dxing, but for flea power transmitters around 6mHz, it is a different story. Even our last transmission in mid 2008 was difficult to hear in the UK. WMR made a transmission on 22nd and 23rd August 2008. It was great to be back on the air after a long break of many months. We made our last transmission in February, after a weekly sched since mid 2006. Freq was AM 6400 only. Skip was rather long that weekend, and to be honest, reception in much of the UK was a little patchy. We had some nice reports from the States though!! It is hoped that we will be on the air a little more regularly in the near future again. Again, WMR has to apologise for the poor response to QSL requests since 2007. They will all be replied to, maybe a job for a cold autumn night..hi. Once again, a summer season has slipped into winter, and WMR is still battling with the propagation on SW. Again we have fallen behind a little with the QSL cards. Here at WMR, we have always believed in old fashioned, hard copy QSL cards, and strive to continue to provide such a service to the DXers who take the trouble to send us in reception reports. It is only fair that we can still verify reports. There are many stations on SW, who simply do not verify reports. This can be annoying to the dxer. Especially if the signals have travelled over a long distance. It is not only hobby pirates who do not verify reports these days. Many of the international broadcasters are reluctant to take the time and reply to mail. Domestic radio stations heard over a long distance can be even more reluctant. Here at WMR, we have to apologise for sometimes being sluggish in getting the mail out to the listeners, but it is hoped that we will always manage to achieve this goal, eventually. Since summer 2007, there have been no QSL cards mailed, but by year end, it is hoped the backlog are all sent out. Since the summer months, WMR has still been a regular voice on the SW, 6400 and // 3910 (Saturday) and 3945 (Sunday). The following announcers have been heard. Jack, Mike, Dave, (The original WMR team from the start in 1980) Andy Walker, Taff, Nick and Brian. We also relayed Radio RWE, a Polish station during our regular broadcasting sched. We operate a weekly sched and because the shows are all pre recorded for security reasons, this means that the programmes are repeated on an MP3 player throughout the day and night, therefore it is impossible to say what show comes on when. As WMR is a hobby pirate, the programme line up can vary from week to week, depends on other commitments. Currently as it stands in November 2007, we have Jack on a weekly basis, Andy Walker on a weekly basis, and Mike is back after a few months absence, due to an accident, when he broke his ankle. We have many kind offers from around Europe for budding SW DJs, but we have no real plans to increase the regular slots. It is assumed the interest is generated because of the better signal we have had in the last few months. I doubt if they would have been so keen if we had still been running 20 watts!! One intersting idea though was to try and encourage guest DJ shows from former SW broadcasters. We are actively promoting a new better sounding e mail address of studio a t wmrscotland dot com The old yahoo address will remain open alongside this newer address, which should be ad and spam free, hopefully. Mid summer often brings out the hoax WMR, and this year is no exception. At around 2100 UTC on 23rd June 2007, there was reported to be some slight QRM on the 3910 signal, and a shift to 3945 was temp made. Underground were not on that night on 3940, as they were in Holland at the summer meeting. Anyway, a move was made to check 3910, and it turned out the BBC Singapore relay was especially strong in Europe that night, causing us a little splatter. Fair enough. After 10m on 3945, a large carrier came on top of WMR, and remained there for a while. Just as we moved back to 3910, the carrier burst into life, and turned out to be the hoax WMR, broadcasting an old off air programme from about 2 or 3 years ago. At that time the off air tape would be made from a 20watt signal in a wood. This went on for hours. While this rebroadcasting is weird in itself, it has been going on now for some 8 summers now, it must also be noted that the last known transmission of the hoax was malicious, in the fact that it came right on top of 6400 on a Sunday morning. It also came on top of WMR while we were on 3945, and had we left the transmitters unmanned by that time, it would have deliberately spoiled the complete Saturday evenings transmission. Luckily the transmitters were manned at the time of the malicious broadcast, and a frequency shift back lf was made. The transmission on 30th June on 3910 was interrupted a little on Saturday evening by Radio Atlantis from Holland coming onto the freq of 3907, just 3kHz away from our channel !! This problem was rectified, thanks to the Alfa Lima forum. Thank you also to Radio Atlantis for your cooperation. It is appreciated. Added a couple of tunes to the wmr audio page. STV old theme tune Scotlandia, as well as WMR theme, Fancy Pants. 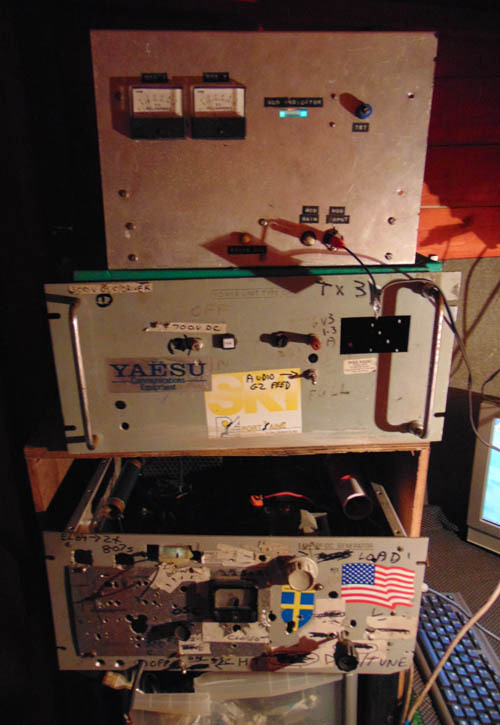 On 16th/ 17th June, after a successful Saturday night of broadcasting, the large 48m band tx broke down during the night. The audio died. Anyone who heard a carrier on 6400 earlier in the morning, heard WMR.... Around high noon in the UK, the 3910 transmitter was moved back to 48m, which is the main freq. The signal strength while down, was acceptable. An unknown signal was heard to play a few tunes around 1030 on 6400. The transmitter was repaired and back on air again in the afternoon, and continued till later that night with at one time split frequencies. (ie separate shows). A test on 6400 and 3910 was made on 21st June, to test some antenna repairs. Difficult to swallow, that we are past the longest day already. Last night, 17th June UTC, around 0300UTC, there was a strong North American pirate signal noted on 6925kHz. A clip of the ID which sounded like Boomerang Radio is to be found here. Assistance anyone. Is it that Wolverine stn?? Answer, yes it is the muffled id of Wolverine Radio. Good signal, just no programming. The band was kind to us on Saturday night with both 3910 and 6400 thumping out to the UK by night. The decision was made to use 3910 at the last minute, and not 3945, but don't worry. We know Reflections Europe use the channel at 1500UTC, 1600 in the UK on Sundays. We would not want you to miss your Sunday hymns!!! After a few months of broadcasting on more or less bang on 6400, WMR has again added a 76m band channel. This part of the SW band has not been used for at least 8 or 9 years by WMR. It almost took another 8 years to find the crystals for 3mHz, but they eventually showed up. Bank holiday Monday brought our 1st test on 3945, and included some slow scan television transmissions. This was just for test purposes, to try out a small free piece of software, MMSSTV. It is available free and is about 2.5meg. search the web for MMSSTV111G.exe. These were received about 150 or 200 miles from the transmitter. Results from the 76metre band tests have been encouraging in the UK, because there has been so many weeks of long skip on 6400. e mails have been very encouraging in recent weeks as well. Programmes for 12th and 13th May will consist of Jack, Mike, Paul Graham, and Dave Anderson. It was good to record shows with Paul and Dave in the studio. This may encourage Dave to return to the fold a little more regularly. On 6th May we also had our first programme from Taffy, using a strange automated voice!!! Taffy should have his microphone working soon!!!! This last month has been a good one for Weekend Music Radio. We have eventually settled on near enough 6400. (6399.9xx), after moving from 6401 to 6400.8, (a huge frequency shift ! ). Thanks to Radio Merlin for the crystal. This will probably be the frequency used for the summer months at least. The middle of the 48m band can unfortunately be subject to stations signing on top of whatever is there!! On 25th March, again WMR was being jammed by person or persons unknown. The freq of the jammer was around 6401, giving a nasty 1kHz tone on WMR's signal. Some crude df tests surprised us, as it seemed to suggest the signal was coming from Eire!! The signal was of a seemingly unmodulated carrier, but during some peaks when WMR signals were not present, it sounded like there was some very very low level audio there. It never crossed our minds to try for // signals in relation to the music, to see if it was a station already on air, with another tx. Watch this space. A recent development is the introduction of streaming audio for the previous weeks show. Anyone who would like to hear our shows in MP3 format, simply click the streaming audio page. Response to the station has also been very good, and we would like to thank so many of you for the continued support and reception reports. It is good to know we are not talking to ourselves. Since summer 2006, WMR has made it to the airwaves on a more regular basis than ever before. Both power and audio have been somewhat increased and improved, making the sound of the station one of the best on the band. Freq is currently more or less 6401kHz. Weekend Music Radio has now been on the air longer than most of the ILR stations in the UK. WMR has been on the air longer than any of the SW stations currently active on the 48m band. (By that we mean, we have never closed down and have been active every year on the bands, since our birth). BRI (Britain Radio International) has the qualification of being second, but only just!! The first successful WMR broadcast (ie widely heard) was 27th April 1980, while BRI was born on 8th June, also in 1980 (from memory). Free Radio has changed dramatically since the very humble beginnings as three (and shortly after four) very young fellows, with more youth on their side than today, set out to start a SW hobby pirate radio station. Radio 1 was on MW, the AM band was clearer, some European stations still closed down for the night, as did TV. Irish pirates flourished on MW. SW was very important internationally as the only medium available to reach the population centres abroad. Now of course there are both satellite and the Internet. Both are quite capable mediums to deliver radio and TV programmes worldwide, with better more reliable audio quality than Short Wave. In the early days of WMR, there were no mobile phones, no internet, no e-mail, so response to the station consisted of a few phone calls to friends down south to see if the signal was OK. Weeks would go past and a package of mail may arrive. Maybe we would see logs in the dx press. Months sometimes would go past, and quarterly free radio publications would raise their heads. Maybe WMR would be logged within their pages, maybe not. Now we can have text messages, e mails, and logs almost straight away on line. Blog pages run by SW fans show if the signals are being heard or not. On line SW receivers are common, sited all over the world. WMR could be described as a bunch of old fashioned short wave / am radio buffs, who are knowingly no more than a hobby pirate chugging away to an ever decreasing and in general, older audience. That said, it is still with some pride that the station is on SW on a regular basis to this day. As long as possible, it is the intention to remain on the airwaves. QSL cards from WMR have been mailed out in early Feb, and hopefully all the listeners will have their QSL packages by the end of the month. The new web site and contact details have been included on the cards. Apologies once again for the long time it takes to send out the QSL packages from WMR sometimes. By the end of Feb, all unanswered mail should have been replied to. Anyone still waiting a reply after this time, should e mail details to us again. (Remember to include a snail mail, or postal address, for replies to be sent to. Many e-mail reports do not include such details). In 1995 & 1996 WMR produced a very long 8 page history. There are still a few left, and these will be mailed out. Once they are gone, they are gone. The complete history can be found on the WMR web site, available to most of the listeners these days. Special circumstances to those living is remote countries with no web access will be made, if anyone really wants a hard copy. Since the summer of 2000, WMR has been the victim of a hoax broadcaster. Some character with obviously good reception and recording capabilities has been recording WMR off air and rebroadcasting these tapes at a later time. At first it was curious, then odd when it was still happening year in year out. These transmissions were in general non malicious until 12th November. On this date WMR was deliberately jammed by this unknown source. Most of the Sunday morning was wasted by a signal on 6400 approx, while WMR, the real WMR was on a kHz or so hf. No reason has ever been given or worked out for these hoax broadcasts. Someone is going to a lot of trouble to cause problems for WMR. On that subject, we have suffered some kind of jamming more than just a few times of late. Radio Duck was jamming us on 4th Feb 2007 around 1350. (radioduck@hotmail.com). An e mail to this address produced nothing. On 10th Feb while tune up music was on, a station came on top, more like 6400.6, and played disco and dance music on top of WMR for a time, in the afternoon. The long term plans for WMR would be to move back to the clearer 41m, but at the present point in the solar cycle, we have to remain lower in freq to be heard in the UK. Inserted a form page to contact WMR instead of the e mail address. The main reason for the form is to assist in the fight against SPAM. In the end this caused more spam than it stopped. The yahoo address is still functional to anyone who prefers to use that method of contact. Saturday 10th Feb: WMR was being jammed again by an unknown station, while we had tune up music on the channel. The biggest thing to happen to the station this week is finally getting some mail replied to. Anyone sending e mail, remember to send a postal address if you want QSLs sent to you. Check out the rare shot below of mail being replied to!!! Thanks to all the dxers for your patience. A new updated information sheet is linked to from the top of this page. This is being mailed out with the rest of the items in the QSL packages. The WMR web site back on line means that at last QSL cards and billheads can pe printed out using the up to date contact details and web address. This was meanty to be done in the summer and get mail replied to, but the free web site which was signed up for was a disaster, flashing ads etc. It is good to hear from old friends who have tuned in to the SW again. There have been quite a few fellows from the past recently tuned into WMR. Time has to be found to update the WMR site with more images and audio now. The broadcast on 14th January on 6401kHz was a roaring success. Only 2 hours of Jack. Mike was suffering from the cold/ flu which is going around. Be assured he will be back soon. The reports have been quite good, and complimentary on the web. Thank you the Swedish report with SINPO of 4s!! The web site was a complete surprise. No previous announcements were made on line, and we relied on the SW broadcast on 14th to publicise the revamped site. Amazingly from the statistics below, there was about 500 hits!!! 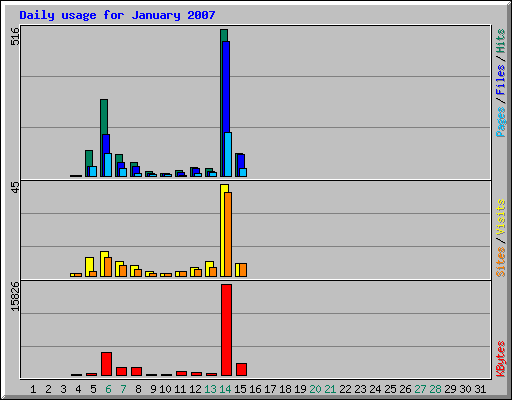 Obviously the first few days traffic was testing the server/ setting up. The former web pages we hoped would become our permanent home in 2006, did not materialise. These was far too much of the screen taken up by the banners etc. A new arrangement has been found, and hopefully this will be a permanent web site. 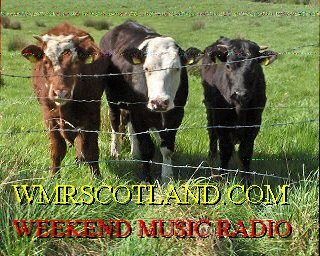 www.wmrscotland.com. The station continues to broadcast more weekends on 6401kHz, and since the summer months, there has been a remarkable difference made to the audio. Signals should be a little better as well, despite the frequencies around 6mHz not being ideal at the present point in the sunspot cycle. After a few years of no web site, because we lost the former host, a new free service has been set up. I know it looks like crap with half of the page taken up by advertising banners, but it is free. If there turns out any other alternative, it will be done. Another web site I set up for a local group had one advertising banner at the top, which zone alarm even takes care of, but this is crazy man.....WMR has recommenced SW transmissions on 6400 after a a long 9 month absense. Main reason is the current band conditions. Week in week out even the high power Dutchies are weak, and Laser non existant, so it seems pointless carting a 20w transmitter to the woods. The current set up should be a bit better than this. Our former web space was lost, and WMR had no web pages for a few years. In fact the next web pages were in summer 2006, but was a poor attempt at a return to the www due to using so called free servers. The past weekends transmission was more of a success, running from Saturday night through to Sunday. Freq again 6400, and a new style modulator held up no problems. 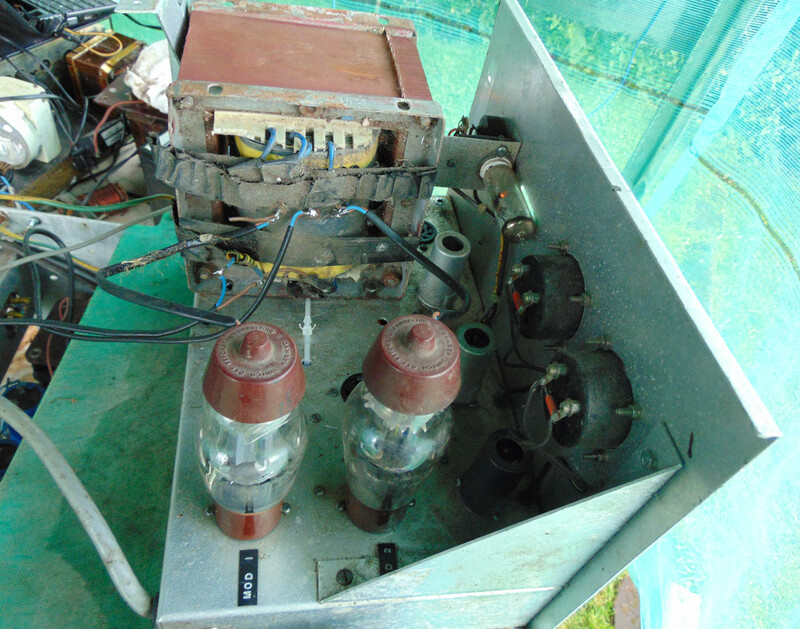 The transformer used is a former Radio Stella modulation transformer, used extensively in 1983!! The mod amp itself this time was an old Eagle PA Amp, which seemed to match up fine to the 807 output valve. Thank you to everyone for all the acknowledgements having received the QSL packages. Hopefully there will be no more delays. Today our transmissions failed even after a major repair to the mod stage. This resulted in about 30m of transmissions going out, when the mod blew again. The transmission was abandoned. Just a thought while digging through some old notes, that some folks may like to view an e mail which WMR received in 1998. This serves as a reminder that e mail has some serious advantages, and what careless use of the bands can result in. The e mail was circulated in the free radio world back then, and stations still pop up around this area of the band. The proper e mail addresses have been edited out, and we ask that these band users are not contacted by anyone. The information shown here is for historical reference only. The transmission on July 6th was hoped to air on the night of 5th July, but because Mike and Jack were away on a sailing cruise on the world famous Waverly, the transmission did not go on air until around 1330 on Sunday 6th July. The Waverly is the last ocean going paddle steamer in the world and at one time made a trip around the Mi Amigo in 1978. Sadly this was after the Mi Amigo sank in March of that year, and we are unsure if the trip was canceled or not. The WMR broadcast started off fine, but a fault developed in the modulator not long after sign on, which was a bit of a pain. Sadly the rest of the transmission was a bit of a disaster, but at least there was a carrier on the new channel of 6400. This should be the frequency used for the rest of the summer months, as the 6310 channel seems to have some heavy digital type traffic on now, which wasn't there a few weeks ago, or at least any time we tuned in. All mail has just been posted now, and should be with the listeners within the week. Let us hope the QSL packages are appreciated, and that they reach their destinations safely. 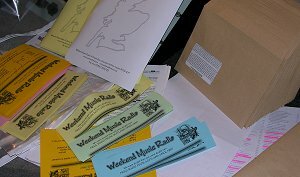 At last after many years of no mail being replied to, WMR has again began to send out QSL packages. These have been mailed out in late June/ early July 2003. There is on July 1st, a large bundle left to post, which should go out this coming week. Hopefully this page will be added to regularly in the weeks to come. Future possibilities include a mailbox page, as opposed to a guest book, which we have no control over. "I must get this mail replied to in the next 5 years or so..."